A God Somewhere uses the comics medium to offer a fresh take on a tale of power corrupting absolutely. It wisely uses its origins to bring race into the conversation. And ultimately, as Mike Mignola suggests on the paperback's cover, brings readers one of the most "human" superhero stories in the medium. From start to finish, it is gripping, and while it has debuted with less attention than it deserves, will undoubtedly find a spot among some of the great graphic novels of this age. it's a huge graphic novel, not terribly original, but very big and dense. don't know this graphic novel, but I try it soon! I'm linking and follow you! Didn't read this one. Never heard about it until now actually. It look really interesting. I'm gonna try to find it. Thanks for the advice ! On your advice, I read that stuff, and it's cool! I discover this one next week, don't read that for now. The work is very Nihlistic to a large degree, and it's hard to feel anything at the end of a Nihlistic novel if the point is "What is the point?" However, the other concept the authors want to get across seems to be "Only what IS matters, not what could be. Regardless of how terrible things are, you must make peace with it and live in the real world." My main gripe about the novel is that Eric's actions lack any reasonable motivation. The only motivation you can pull out is "He's insane, so who knows WHAT motivates him." Most insane people have a motivation of some kind, and usually mirrors how rational people act, but in some twisted way. 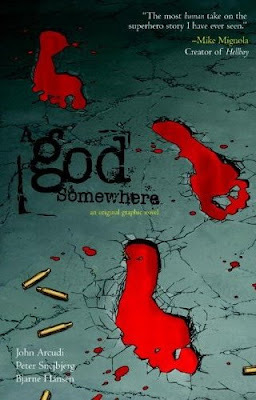 Having read almost all of the great mythologies, I had to read A god Somewhere many times to comprehend it. How can Eric be lucid, near omniscient, with telepathic and telekinetic powers, and at the same time be a berserk monster? In other words, as Sam says, he is a "mass murdering Buddha." Imagine the carnage if the Hulk's battles with the Army were shown realistically. This is a graphic novel, and the carnage is graphic. Yet, Eric is much more than the Hulk. He can defeat an Army brigade with his mind alone. Indeed, his powers are god-like, and that is the rub. A being with Eric's powers has to be either accepted as a god, or go insane. Or perhaps it was inevitable he go insane. God never spoke directly to Eric to explain his powers to him. At first he believed God gave him his powers, and then Eric came to believe he himself was a god, somewhere, in some other, smaller universe. But how could he be a god in our universe, without a clear link to God? How can he be a god, with his brother putting him down? Instead of looking up to him, putting him down. With a put-down like that, it was easy for Eric to go from god to monster. 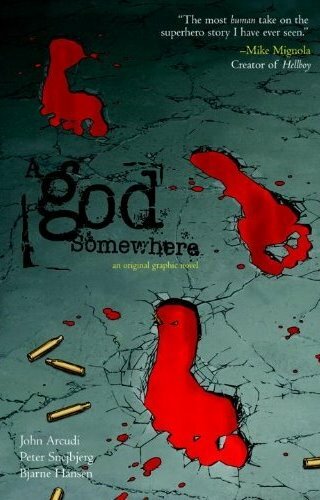 A god Somewhere is an incredible mix of superhero, mythology, and theology, never seen before in comics or graphic novels. I'm a tattooed woman with high responsabilities and who can live one life without secrets and with proud.